The possibilities and ideas were endless! "As I reflect back to the beginning of my journey with YogaBeez, I can definitely highlight the continuous understanding and support that I have received from Bryony, right from the very first time we spoke over the phone. Her passion and ambition to make a difference in today's modern society was such an inspiration for me that I wanted to be part of this hive. Taking everything into account from the Foundation Stage, I can only re-affirm my strong believe and strongly commit myself into continuing the YogaBeez unique journey. The knowledge and open approach of the tutors was a truly magnificent experience and I can hardly wait to see what the next modules unfold into! I think we all have brought together a really special gift to the course and hopefully we can all keep that special seed growing and look forward to celebrate together being part of the YogaBeez Family. The possibilities and ideas were endless! I honestly can't thank you enough for all the tools and inspiration that the training have given me to improve my current classes,"
"What a wonderful experience, a gift really which keeps on giving... reconnecting with one's inner child felt warm and comfortable, seeing how simple things can make yoga accessible for children, making it FUN and joyous, and being surrounded with fellow students to embark on a path which is exciting and thrilling. A couple of months later I can say it has already entirely changed my perspective on things, life, friends, family and perhaps most of all, the way I look and interact with my own children." "YogaBeez training with Bryony is outstanding. I signed up for the Foundation and Advanced training, not really knowing what to expect, except that I wanted to understand how to teach yoga to children and teenagers. What I gained from this experience was significantly more. 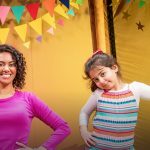 Bryony takes you on a journey not just into the mind and body of a child and teenager, but also on an experience that is so enriching and special on a personal level. Bryony is very generous with sharing her knowledge and experience and she’s constantly encouraging, empowering and inspiring, and her feedback is always constructive and positive. 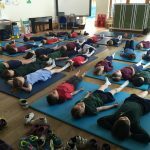 The YogaBeez approach blends traditional yoga with the Montessori principles of hands on learning and giving children creative choices which works incredibly well together - this not only makes it a more engaging experience for the child, but it also adds another fascinating dimension to teaching yoga to children. 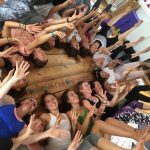 I would not hesitate for a second to recommend YogaBeez training to anyone thinking of becoming a children or teen yoga teacher." "Thank you for your wisdom, passion, energy and warmth. You have given me the confidence to continue on this path of truth and light. May we all share the miracles of yoga with the same open heartedness that you gave it to us. This training was energising, hands-on, creative and informative." "Bryony is the real deal when it comes to being both a yogi and a teacher. She comes from a wealth of experience and shares her knowledge in a genuine way. Her lessons and resources for teaching yoga to kids are thorough and effective, they exceeded my expectations. 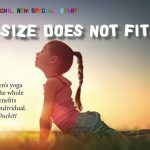 I feel really confident in starting my children's yoga classes." I am literally buzzing! Is that why you called it YogaBeez?! "I realised during this course that a children's yoga class is really a laboratory and a microcosm, and that we have unlimited possibilities to bring nature, sciences, arts, colours, psychomotor activities and languages to it. I have never thought of how a yoga class, apart from passing on yoga which is already a treasure for us all, it can also be so rich pedagogically. Finally, after this training I realised how serious and buttoned up we all behave and that this is a big mistake. We slowly and gradually distance ourselves from the source of laughter and lightness that lies inside us. It was a great therapeutic experience for me to learn and also play and laugh with everyone else and touch and dance and move freely as a child. I felt safe in the hands of this great educator who works with respect and love for children and I took back home so much out of this training." "I laughed, I cried, I laughed, I played, I helped and was helped, I sang, I danced, I tasted, I created and daydreamed about this time and not that time, in time and with time, I painted the universe with colour and felt your colour and found my voice, I heard my quiet, I was found and I discovered my lost… in me, in we and them and in us. I am I am I am I am… my breath! You are good… I am good… we are good. The you in me recognises the me in you. Thank you for you. Thank you for sharing such a special gift. I will always remember your voice when I hear a chime. Thank you." "The YogaBeez training was really special. Just fabulous, the best thing I’ve done in years!"